The march of cloud computing across the enterprise continues, as IBM recently announced a portfolio of private cloud offerings. These offerings have been designed from the ground up for enterprises, and seek to allay some of the concerns that large enterprises have over the security and readiness of the cloud for business-critical computing. 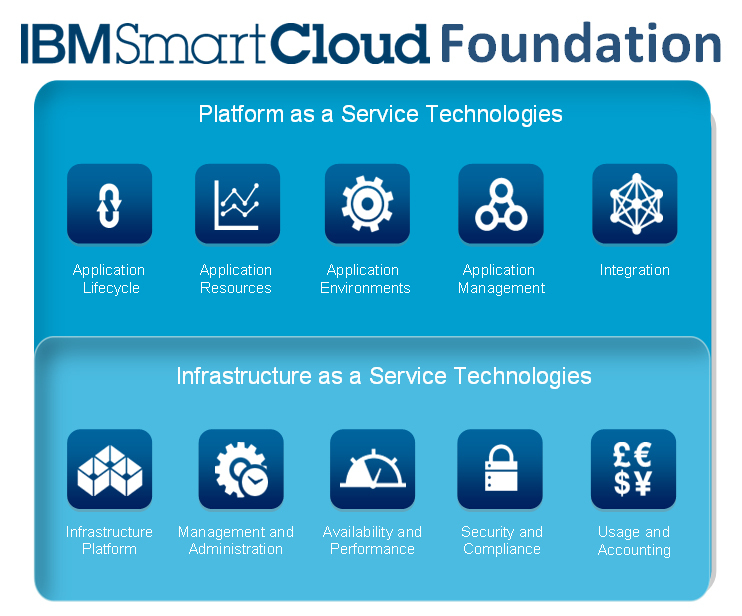 IBM’s SmartCloud Foundation portfolio includes a core set of private cloud functions that are based on IBM’s significant volume of client engagements and its management of cloud-based transactions for enterprise customers. It is designed to appeal to the demand by enterprise clients for secure, private cloud resources as they seek to transition from virtualization toward cloud infrastructures. Infrastructure as a Service (IaaS) – In this model, enterprises outsource hosting and administration of the entire computing infrastructure. Typically, customers pay for the amount of resources they consume during a given period of time. An example would be Amazon Web Services. Platform as a Service (PaaS) – This model is similar to IaaS in that enterprises outsource hosting and administration of their entire infrastructure. In addition, PaaS provides an additional layer of application-related intelligence, facilitating application development and deployment to the cloud infrastructure. Microsoft Azure and Google App Engine are examples of PaaS. Software as a Service (SaaS) – This model is the most popular, and reveals the highest goal of the cloud. In addition to the PaaS, which includes the entire infrastructure and an environment for application development, SaaS offers the development, deployment, management, maintenance of the entire business application. An example of a popular SaaS provider is Salesforce.com. As we detailed in a recent column about Cloud Computing, many enterprise have reservations about the public cloud infrastructure, with security being one of the most common concerns. For this reason, enterprises have turned to the private cloud to find a happy medium between the efficiencies and connectivity the cloud offers, but with the control of a private network. A private cloud is considered a highly virtualized infrastructure that an IT organization maintains and enables business units to “subscribe” to the cloud services. The benefit of private clouds is that organizations can dramatically increase their flexibility around computing resources, but still maintain control of their data and applications. The IBM announcement includes three components of the IBM SmartCloud Foundation: IBM SmartCloud Entry solution designed to help customers create private clouds on virtualized IBM System x and Power Systems hardware; IBM SmartCloud Provisioning software offers a provisioning engine and image management system to dynamically create or provision virtual machines; and IBM SmartCloud Monitoring provides visibility into the performance of virtual and physical environments, including storage, network and server resources. IBM has designed this portfolio to help its enterprise customers quickly adopt private clouds and leverage the flexibility of the cloud infrastructure. It gives enterprises the opportunity to move beyond virtualization while still maintaining control of the security, access, and deployment of business-critical applications. While IBM is certainly not the first vendor to offer private cloud services, its announcement solidifies the future of the cloud in the enterprise computing environment. There is no doubt that the cloud will be a part of every enterprise IT environment in the future. This offering gives customers familiar with IBM’s deep enterprise capabilities the ability to move further into the cloud landscape while still maintaining control.